The two June auctions at GROSVENOR brought under the hammer a wide ranging offering of material for specialist collectors and achieved an impressive combined total of £816,213. The catalogue for the auction of the Rev. Roger de Lacy-Spencer Collection of Railway Stamps, held on June 4th, will be an important work of reference for collectors of this fascinating subject in years to come and strong bidding was received from around the world for the many rarities it contained. Essay material was deservedly popular with three attractive “RAILWAY/LETTER/POSTAGE” overprint trials from 1890 in different types on the Great Britain 1887–92 ‘Jubilee’ 3d. (lot 2109) reaching £7,122 whilst the beautifully executed De La Rue 3d. handpainted essay in green and white (lot 2105) climbed impressively to £4,666. 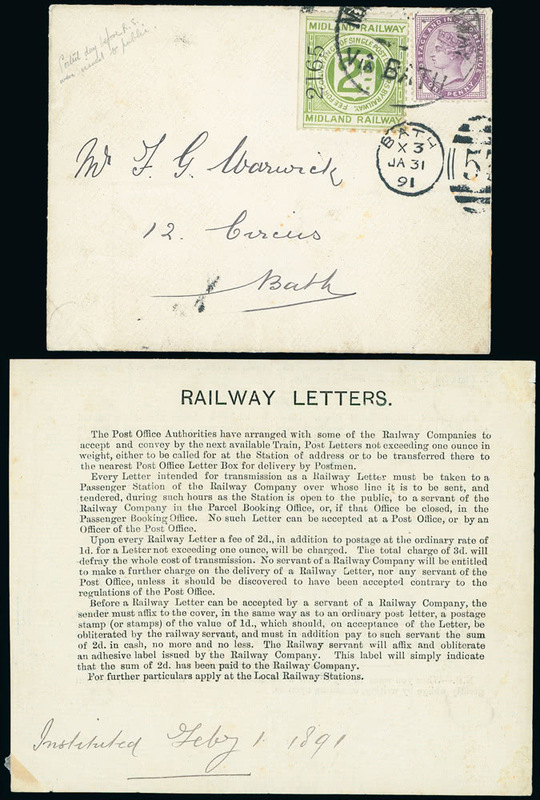 Early railway covers are scarce and highly desirable. 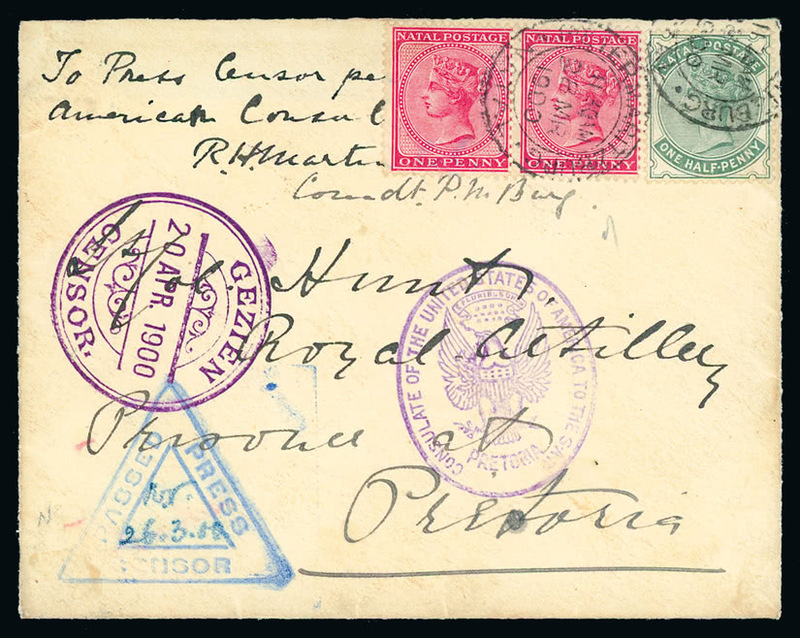 A ‘crown jewel’ among these, he ‘pre-first day’ Midland Railway envelope (lot 2262) sent to Bath on Jan. 31st 1891, the day before Railway letter stamps were issued to the public, found a pleased new owner for £3,070. 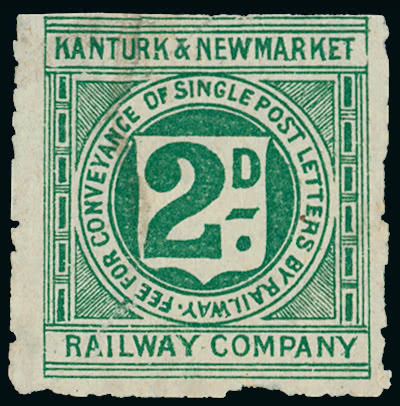 Amongst the Irish rarities was an unused example of the Kanturk & Newmarket Railway Company 1891 2d. 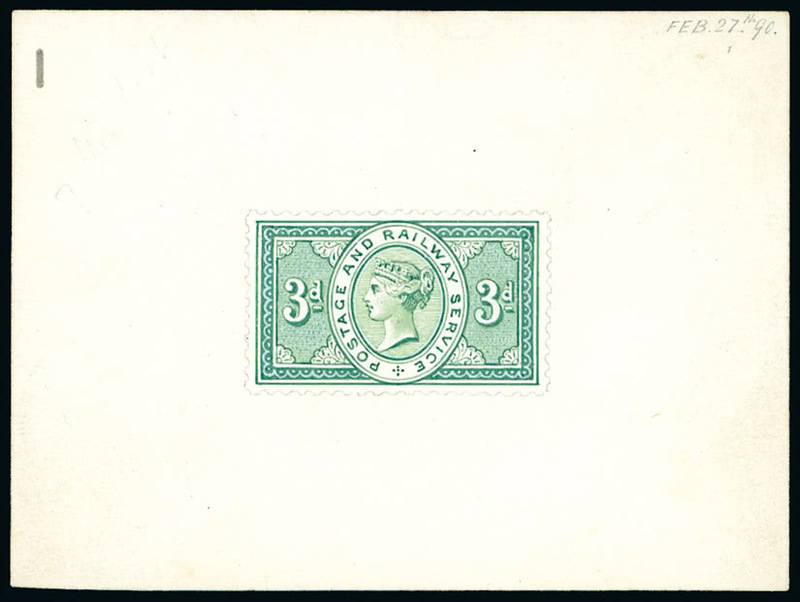 dark bluish green (lot 2631, left). This is a very scarce item today as only 150 were originally produced and it sold well for £1,351. The sale also included rare railway material from a good range of other countries, Australian items being particularly well supported. 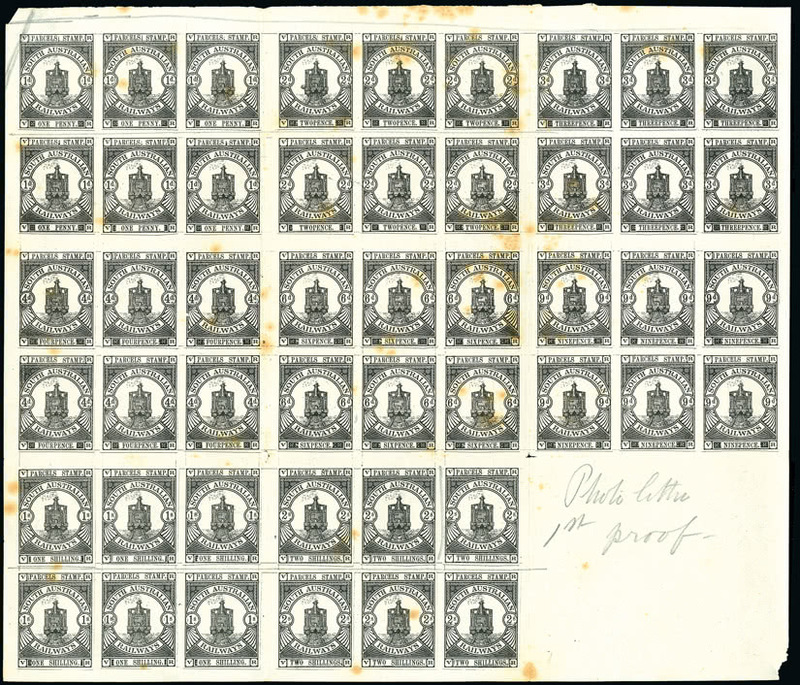 Top price in this section was the £2,101 paid for the 1885 sheet of 24 stamp sized essay proofs for South Australia Parcels stamps denominated from 1d. to 2s. (lot 2035). Among the special sections included in the British Empire & Foreign Countries auction held on June 3rd was the exceptional Dr Guy Leroux collection of the Second Anglo-Boer War containing many rare covers from this fascinating period of imperial history. 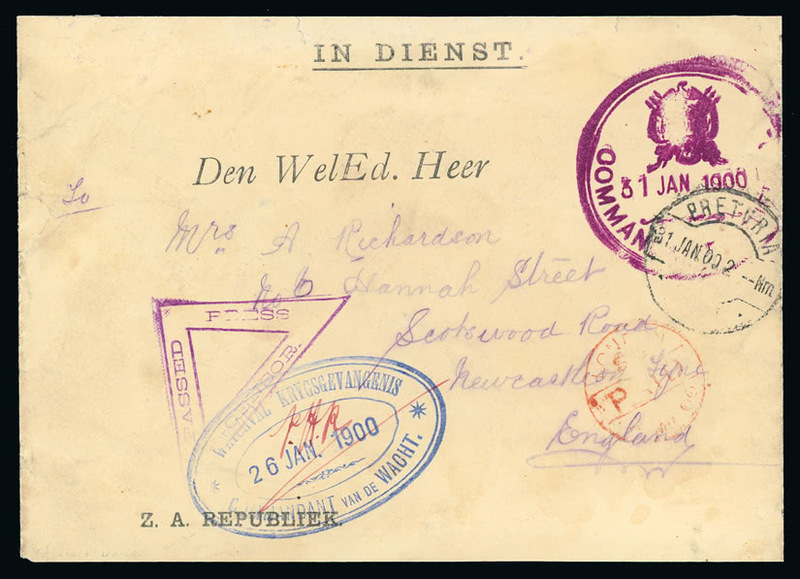 Featured on the front cover of the catalogue, the colourful 1900 envelope addressed to Lt. Col Henry Hunt, Senior Officer among the British prisoners of war (lot 1317), realised £860, whilst an attractive outgoing ‘In Dienst’ envelope showing strikes of the Waterval Camp Commandant’s blue datestamp and purple cachet of the Commandant General in Pretoria (lot 1316) rose to £1,203. A strong section of India produced the highest price of the day, £10,710 being paid for a neatly cancelled pair of the 1854-55 4a. blue and red, Head die II, Frame die I, third printing, from stone ‘B’ (lot 822), threatening its £13,000 catalogue value. China and Hong Kong, which featured the W.E.J. ‘John’ Major collection, were also well supported. An exceptional offering of Ceylon, including the Graham Winters collection of Queen Victoria issues, was less consistent, the ‘Pence’ issues faring better than the ‘Decimal’. 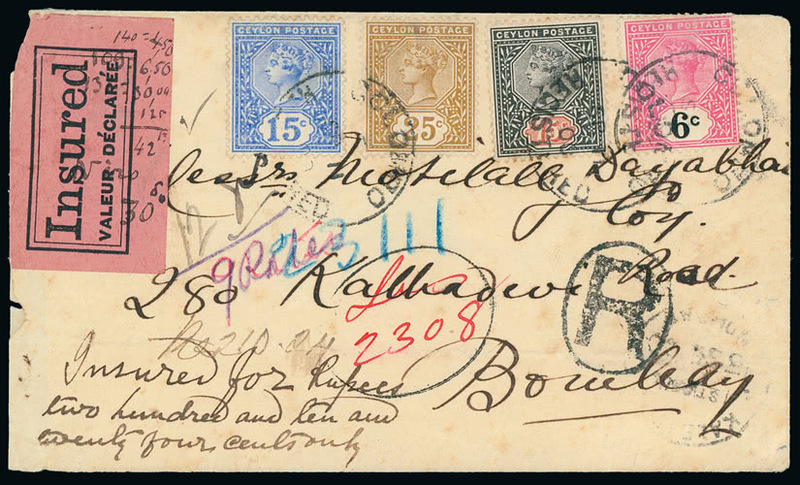 The 1900 registered insured cover from Colombo to Bombay (lot 472) bearing four different values achieved £675, whilst a handsome mint block of nineteen of the 1887 1r.12 dull rose on blued paper, the largest recorded multiple (lot 404), climbed impressively to £892 despite minor imperfections. 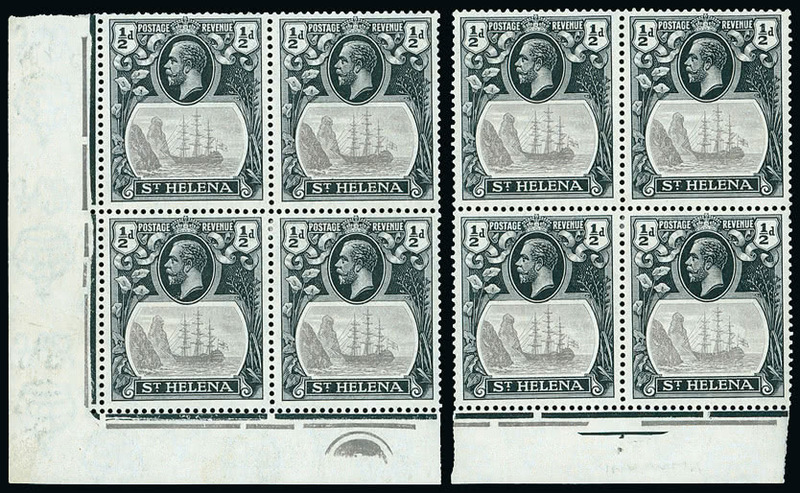 An interesting offering of Saint Helena included two very rare corner marginal blocks of four of the 1922-37 1/2d. with watermarks inverted, these showing the ‘cleft rock’ and ‘torn flag’ varieties respectively (lot 1206). 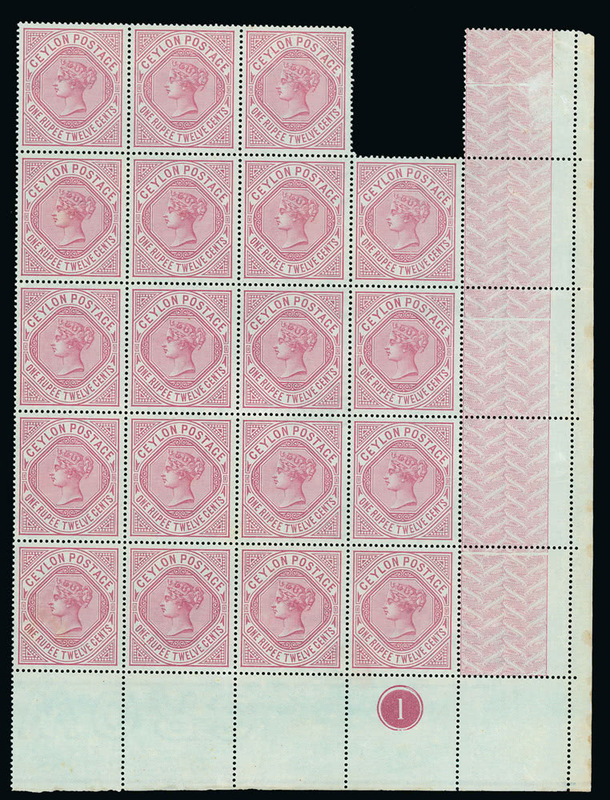 As only four sheets with inverted watermark are known these blocks are likely to be the only surviving positional blocks showing these flaws and the £9,824 paid was well merited. 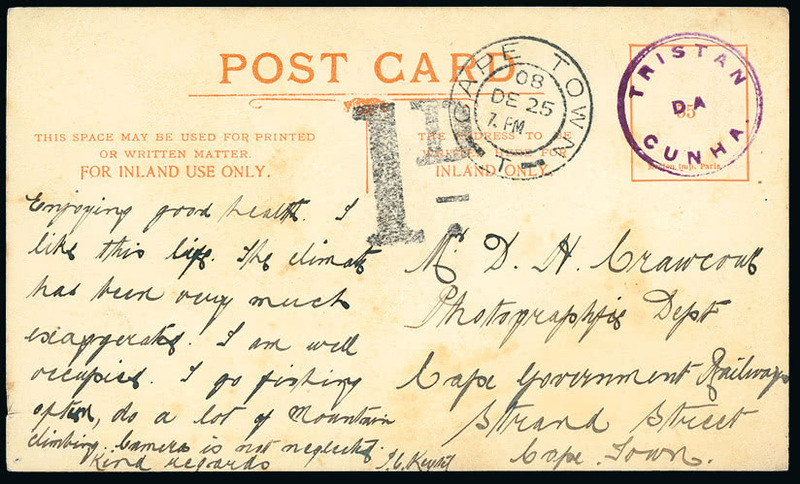 A fine example of the first use of the Tristan da Cunha type I cachet on 1908 postcard (lot 1445) realised £5,526. Prices quoted include buyer’s premium and taxes. Full listings of prices realised at each auction may be downloaded from the Grosvenor website www.grosvenorauctions.com. Please contact Andrew Williams at Grosvenor for further information.